The Glory controlled possession for most of the game and after Luke Salmon gave them the lead in the 34th minute the result never looked in doubt. This was Lions’ first match following former coach Keegan Ashley’s resignation, and they struggled to gain a foothold in the match and found it difficult to break down the Glory’s formidable defense. The in-form Salmon, who netted twice last week against ECU Joondalup, was picked out by Daniel Stynes in the box and scored with a powerful close range strike that went in off the bar. There was controversy over whether the ball crossed the line after rebounding off the underside of the bar but Stirling’s appeals were waved away and the goal stood. Salmon again found himself at the centre of the Glory attack in the 68th minute as he broke down the left wing and cut back a low cross to find Gabriel Popovic who had a simple finish to make it 2-0. 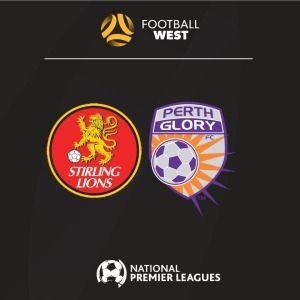 The loss for the Lions sees their winless start to the season continue as they look to claim their first win next week at home to ECU Joondalup, whilst the three points for the Glory sends them to 2nd in the table.